There will be no hole in the ground, at least for now. Wake Stone is temporarily prohibited from starting its new quarry operation near Umstead State Park, according to an injunction granted in Wake County Superior Court. The company may conduct exploratory borings, but can’t clear trees or begin digging the pit on the 105-acre tract. The Umstead Coalition is among several plaintiffs who asked for the injunction, alleging that a March 1, 2019, lease agreement between the RDU Airport Authority and Wake Stone is illegal. Since the property would be leased for “non-aeronautical use,” the Federal Aviation Administration must approve of the agreement, known as a “release.” However, the RDU Airport Authority has not requested a release, nor has the FAA granted one. The lease is for 25 years, plus a 10-year extension. The airport could earn from $8.5 million to $24 million from lease payments and potential royalties over that time. Wake Stone has also agreed to contribute $3.6 million for Wake County to manage a parcel known as the “286 tract” for mountain biking, and to fund connectors between the park and greenway system. The company would also pay another $3 million to reclaim part of the land when the mineral sources have been exhausted – in the middle of this century. The airport bought the land in 1970 for a runway that was never built. Wake Stone had proposed quarrying the land several years ago, but the airport authority rejected the request. The company then built a quarry on private land nearby. The plaintiffs also argue that non-aeronautical uses of the property must be approved by the four local governments that have a stake in the airport: the cities of Raleigh and Durham, and the counties of Wake and Durham. None of those governments has agreed, or even been approached, to approve the quarry. An evidentiary hearing will be held within the next two weeks to hear the case on its merits. 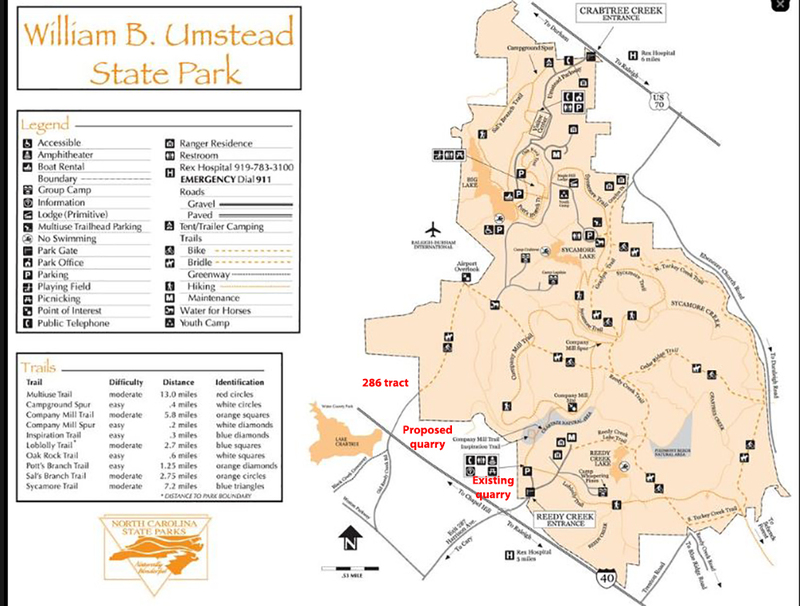 In addition to the Umstead Coalition, the plaintiffs are Triangle Off-Road Cyclists, William Doucette, and Tamara and Randal Dunn. The Dunns own property couched between the park and the airport land; the Airport Authority has reserved the right to use eminent domain to seize the Dunns’ property and another tract owned by Betsy Beasley in order for the quarry to operate.